Ubisoft Toronto has decided that Sam Fisher shouldn't be extracting intelligence at knife-point. 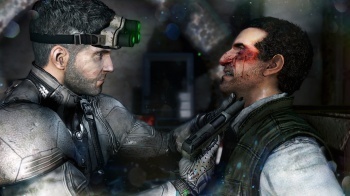 During E3 2012, Ubisoft Toronto presented footage from Splinter Cell: Blacklist in which a player-controlled Sam Fisher stabs and tortures an NPC for information. Not only does this scene paint the series in a much darker light than previous entries, it's also an understandably sensitive topic for many, and negative reactions inevitably followed. In response, producer Andrew Wilson has stated that although the footage lacks context, including the fact that torture was an optional mechanic, Ubisoft Toronto has decided to remove the offending scene from the game. "Definitely we are not going to see when the game's coming out that there are torture scenes in it," Wilson said. "That scene is not there any more. I've not really heard anyone say they loved it." According to Wilson, part of the problem is that E3 presentations lack context and emphasize the appeal of violent in-game actions. "Because of the nature of E3, there are certain things that are easier to demonstrate," Wilson said. "Obviously we were up on stage at the beginning, and it's quite hard to get the value of a stealth playthrough in that environment. We would have got a negative reaction if we showed that kind of stuff." Wilson also stated that any torture scenes would have been optional, and that Blacklist's tone is actually fairly similar to previous Splinter Cell games. I understand why in-game torture would make people uncomfortable, mostly because it makes me uncomfortable. That's kinda the point: you shouldn't watch a torture scene and say that you "loved it". Still, it's worth mentioning that the Black Ops games already depict player-sanctioned torture, and fairly unrealistic portrayals at that. In other media, Zero Dark Thirty has sparked a conversation about torture in film, and there are many books and TV shows addressing the topic as well. Blacklist's torture scenes could ultimately have been dismissed as exploitative, but the subject matter may have been worth exploring, even if it's just an espionage game.